When it comes to decorating, everyone has their own approach, whether they get inspired from an Ikea catalog, or have a hidden talent for interior design, why make décor a bore? Stay away from the norm and let your creative flag fly. Let each room express a part of you with a mix of your everyday necessities and the quirky gadgets, accessories and colors that add the personalized touch that turns your new space into your happy place. 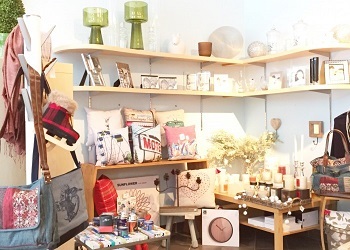 Here are our suggestions for boutiques you might have never thought of before, filled with original design ideas for any one and every one, only minutes from your door. If you’ve got a retro taste you’re trying to mesh with the modern world, welcome to Curio-Cité, always ready to peak your curiosity. The colorful, vintage styles take you back to a simpler time when the thought of advanced technology had you referring to the Jetsons. And their modern flair is just the right amount to have the best of both worlds. You can go from lava lamps and vintage rotary dials and pastels, to bar stools and ottomans. You can even find a use for your knife set and your anger with the ex knives that figuratively allows you to put knives through a metal person knife holder. You never know what you’ll find! Buk et Nola is an originality of artsy refined design. 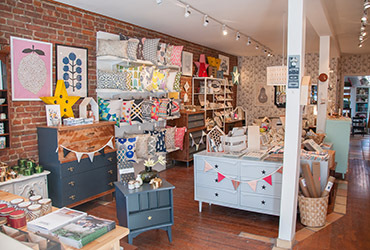 Their boutique is filled with softer tones, intricate patterns, and inspirational homey quotes. They designers found a way to make things like ceramic cactuses a center piece and various subway systems around the world that become the wall picture you were missing as the finishing touch. They have kid options as well, and anything you need for every room and space. Buk et Nola thinks outside the box and will have you happy you did as well. Kokoon’s designs are smart and creative, covering you for the basics and the things you can’t believe someone finally thought of. I mean they actually made funky sunglasses and remote controller organization boxes. Now, you can save your time looking through each purse for those darn sunglasses in the morning, and sit back and relax at night without playing the blame game or turning your house into a war zone looking for the remote. 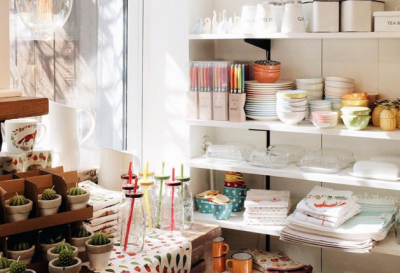 From bean bags for your kids, or the kid in you, pots for your flowers and spices with chalk labels to differentiate what’s what before they sprout, and your house basics, Kokoon is the new store on the block. One old soul, with a twist of modern class has VdeV setting you apart with their take on design. They found a way to make your home staple items a hit with rich wooden coffee tables and furniture, homemade soy candles, lotions, and soaps that keep you and your guests relaxed and smelling lovely, and wall decors that make you stop and admire. Their diverse color pallet of pastels and bright mixes can accent any décor, and their shoe polish sets and funky geometric accessories take you back to the beauty of a simpler time. You can even go making your nana proud with crochet coasters.